Lev Kuleshov (1899–1970) was the first aesthetic theorist of the cinema. An outstanding figure in the “montage” school, he was a key influence on Eisenstein and Pudovkin. Kuleshov was the first to see clearly that montage—the assemblage and alternation of shots—was the very essence and structure of cinematic expression, often overriding the significance of the content of the shots themselves. Deriving his insights from close study of American films (particularly D. W. Griffith’s), Kuleshov used his experience in prerevolutionary Russian films and his wartime efforts in Soviet documentaries to conduct experiments in film acting and montage. He developed an editing method later referred to as the “Kuleshov effect” that juxtaposed shots to evoke new meanings from the combinations. In one experiment, he intercut identical shots of an actor’s neutral face with shots of a bowl of soup, a child in a coffin, and a sunny landscape to evoke different emotional responses from the audience. Kuleshov also “synthesized” a nonexistent woman from close-ups of different parts of several women and created artificial landscapes by intercutting shots of locations separated by great distances. Kuleshov taught at the Soviet film school and was a well-known director of features, and Kuleshov on Film contains essays on both the theoretical and practical sides of filmmaking. Influenced by Futurism, Russian Formalism, and structural linguistics, Kuleshov’s analysis can now be seen as semiotic, presaging studies of film as a system of signs. As a Marxist and structuralist, Kuleshov examined form and content with a materialist approach. The translator’s extensive introduction discusses Kuleshov’s use of signs, typage, and other structuralist concepts and places him in the development of semiotic thought. It also provides intriguing biographical detail on Kuleshov’s conflicts with advocates of “socialist realism,” who attempted to stamp out the artistic and theoretical innovations of the early revolutionary years, and establishes Kuleshov’s position as one of the great figures in the evolution of film. 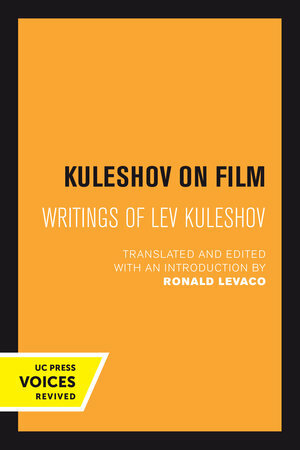 Kuleshov on Film is essential reading for everyone seriously concerned with the cinema. Lev Kuleshov (1899–1970) was the first aesthetic theorist of the cinema. Ronald Levaco is Professor Emeritus at San Francisco State University.